The Spartanburg Methodist College Pioneers Women’s Soccer ID Camp is especially for all girls entering grade 9 to grade 12 who are aspiring to become a college soccer student-athlete. This elite soccer identification camp is going to run from 10:00 AM until 4:00 PM on the 19th of August. This soccer program is going to take place at the scenic Spartanburg Methodist College campus in Spartanburg, South Carolina. In addition, this soccer identification camp will include training sessions that will enhance the players offensive and defensive capabilities. There will also be competitive 7v7 and 11v11 matches, a campus tour, and a college recruiting talk. The camp registration fee which includes a camp t-shirt and lunch is $100 per player. Furthermore, the event is requesting every participant to bring their own soccer ball, cleats, and shin guards. Running this program is the Spartanburg Methodist College Pioneers women’s soccer coaching staff. It will be a fun but challenging experience. Spartanburg Methodist College, originally the Textile Industrial Institute, is a private, coeducational, not-for-profit, junior college in Spartanburg, South Carolina. It is offering associate courses in arts, science, criminal justice, religious studies, fine arts, and business. Spartanburg Methodist College is a member of the International Association of Methodist-related Schools, Colleges, and Universities (IAMSCU). Currently, Spartanburg Methodist College is serving around 800 undergraduate students. 52 percent of this undergraduate student population are male students and 48 percent are female students. This student population is also through a 70 percent enrollment acceptance rate. Correspondingly, Spartanburg Methodist College’s student to faculty ratio is 20:1. As a whole, the institution has an accreditation from the Southern Association of Colleges and Schools and the University Senate of the United Methodist Church. Moreover, in athletics, Spartanburg Methodist College fields 14 intercollegiate men’s and women’s teams in the National Junior College Athletic Association (NJCAA) Division I Region X. They are the Pioneers and their identity colors are blue and white. 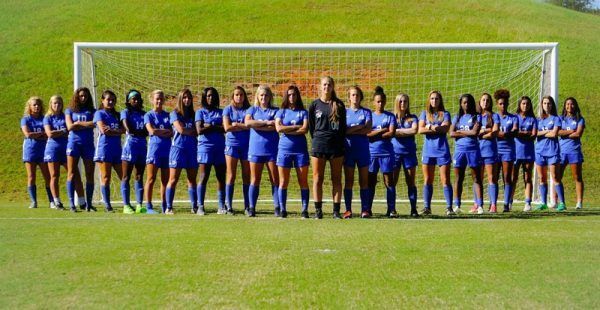 The Spartanburg Methodist College women’s soccer team have already won titles in South District, Carolina District and Region 10. Meanwhile, the college’s men’s soccer team is the 1994 NJCAA National Champions. The Spartanburg Methodist College Pioneers women’s soccer head coach is Dan Kenneally, a native of Rockville Centre. New York. He is at the helm of the Pioneers women’s soccer program since the 1995 season. Coach Dan Kenneally is a bachelor’s degree in business administration graduate from Alfred University. He is also a two-year degree graduate from the State University of New York at Farmingdale. Ultimately, Coach Dan Kenneally is a three-time men’s soccer Region X Coach of the Year awardee. He is also the 2010 men’s soccer NSCAA/Mondo NJCAA Division I South Coach of the Year, the women’s soccer 1999 Region X Coach of the Year, and the 2003 Golf Coach of the Year awardee. Furthermore, Coach Dan Kenneally has led the Pioneers men’s soccer team into four Region X titles. He also led the Lady Pioneers soccer team to six Region X titles and their first-ever NJCAA National Championship Tournament appearance. Coach Kenneally is now holding an overall men’s soccer coaching win-loss record of 146-104-22 and women’s soccer coaching win-loss record of 116-97-17. Come and join the Spartanburg Methodist College Pioneers Women's Soccer ID Camp. It is a six-hour hour program that will run from 10:00 AM until 4:00 PM on the 19th of August. This event is intended for grade 9 to grade 12 girls who desire to take their game to the collegiate level. The ID camp registration is on a first come first served basis.